A.A.P. Koppers, 1992. On the Migmatites of the West Uusimaa Granulite Complex, SW Finland. M.Sc. Thesis, Free University Amsterdam, Department Petrology and Isotope Geology. A.A.P. Koppers, 1992. P-T-t Paths in Metamorphic Belts: obtaining Prograde and Peak Metamorphic P-T-t Conditions from Garnets. M.Sc. Thesis, Free University Amsterdam, Department Petrology and Isotope Geology. A.A.P. Koppers, 1993. Isotopic Characterization of Oceanic Basalts and Identification of their Mantle Components. M.Sc. Thesis, Free University Amsterdam, Department Petrology and Isotope Geology. J.R. Wijbrans, M.S. Pringle, A.A.P. Koppers and R. Scheveers (1995). Argon Geochronology of Small Samples using the VULKAAN argon laserprobe. Proceedings Koninklijke Nederlandse Akademie van Wetenschappen, 98: 185-218. A.A.P. Koppers, H. Staudigel, J.R. Wijbrans and M.S. Pringle (1998). The Magellan seamount trail: implications for Cretaceous hotspot volcanism and absolute Pacific plate motion. Earth and Planetary Science Letters, 163: 53-68. A.A.P. Koppers, H. Staudigel and J.R. Wijbrans (2000). Dating Crystalline Groundmass separates of Altered Cretaceous Seamount Basalts by the 40Ar/39Ar Incremental Heating Technique. Chemical Geology, 166: 139-158. W.W. Sager and A.A.P. Koppers (2000). Rapid Late Cretaceous polar wander of the Pacific plate: a true polar wander event? Science, 287: 455-459. S.R. Hart, H. Staudigel, A.A.P. Koppers, J. Blusztajn, E. T. Baker, R. Workman, M. Jackson, E. Hauri, M. Kurz, K. Sims, D. Fornari, A. Saal and S. Lyons (2000). Vailulu'u Undersea Volcano: The New Samoa. Geochemistry, Geophysics, Geosystems, Vol 1, Papernumber 2000GC000108. A.A.P. Koppers, J. Phipps Morgan, W.J. Morgan and H. Staudigel (2001). Testing the fixed hotspot hypothesis using 40Ar/39Ar age progressions along seamount trails. Earth and Planetary Science Letters, 185: 237-252. P. Solheid, C. Constable, A.A.P. Koppers, M. Jackson and S. Banerjee (2002). Research-oriented database for rock and paleomagnetism to be developed. EOS 83-48: 560, News Item 26 November 2002. H. Staudigel, J. Helly, A.A.P. Koppers, H. Shaw, B. McDonough, A. Hofmann, C. Langmuir, K. Lehnert, B. Sarbas, L. Derry and A. Zindler (2003). Electronic data publication in geochemistry. Geochemistry, Geophysics, Geosystems: paper number: 2002GC000314. J. Helly, H. Staudigel and A.A.P. Koppers (2003). Scalable models of data sharing in Earth sciences. Geochemistry, Geophysics, Geosystems: paper number: 2002GC000318. L. Tauxe, C. Constable, C.L. Johnson, A.A.P. Koppers, W.R. Miller and H. Staudigel (2003). Paleomagnetism of the southwestern U.S.A. recorded by 0-5 Ma igneous rocks. Geochemistry, Geophysics, Geosystems: paper number: 2002GC000343. A.A.P. Koppers, H. Staudigel, M.S. Pringle and J.R. Wijbrans (2003). Short-lived and discontinuous intra-plate volcanism in the South Pacific: hotspots or extensional volcanism? Geochemistry, Geophysics, Geosystems: paper number: 2003GC000533. S.R. Hart, H., Staudigel, R. Workman, A.A.P. Koppers and A.P. Girard (2003). A fluorescein tracer release experiment in the hydrothermally active crater of Vailulu’u volcano, Samoa. Journal of Geophysical Research: paper number: 2002JB001902. 11 pp. H. Staudigel, S. Hart, A.A.P. Koppers, C. Constable, M. Kurz, R. Workman and E. Baker (2003). Hydrothermal venting at Vailulu’u seamount: the smoking end of the Samoan chain. Geochemistry, Geophysics, Geosystems: paper number: 2002GC000314. 17 pp. A.A.P. Koppers, H. Staudigel and R.A. Duncan (2003). High resolution 40Ar/39Ar dating of the oldest oceanic basement basalts in the western Pacific basin. Geochemistry, Geophysics, Geosystems: paper number: 2003GC000574. 22 pp. A.A.P. Koppers, R.A. Duncan and B. Steinberger (2004). Implications of a nonlinear 40Ar/39Ar age progression along the Louisville seamount trail for models of fixed and moving hotspots. Geochemistry, Geophysics, Geosystems: paper number: 2003GC000671. 22 pp. A.A.P. Koppers and H. Staudigel (2005). Asynchronous Bends in Pacific Seamount Trails: A Case for Extensional Volcanism? Science 307: 904-907. H. Staudigel, S.R. Hart, A. Pile, B.E. Bailey, E.T. Baker, S. Brooke, D.P. Connelly, L. Haucke, C.R. German, I. Hudson, D. Jones, A.A.P. Koppers, J. Konter, R. Lee, T.W. Pietsch, B.M. Tebo, A.S. Templeton, R. Zierenberg and C.M. Young (2006). Vailulu’u Seamount, Samoa: Life and Death on an Active Submarine Volcano. Proceedings National Academy of Sciences, 103(17), 6448-6453. ARTICLE# 06-00830. N. Hirano and A.A.P. Koppers (2007). Response  to Another Nail in Which Coffin? Science 315(5808), 40. M. Jackson, S.R. Hart, A.A.P. Koppers, H. Staudigel, J. Konter, J. Blusztajn, M. Kurz and J.A. Russell (2007). The return of subducted continental crust in Samoan lavas. Nature 448, 684-687, doi:10.1038/nature06048. A.A.P. Koppers, J.A. Russell, M. Jackson, H. Staudigel, J. Konter and S.R. Hart (2008). Samoa reinstated as a primary hotspot trail. Geology 36(6), 435-438, doi:10.1130/G24630A.1. N. Hirano, A.A.P. Koppers, A. Takahashi, T. Fujiwara and M. Nakanishi (2008). Seamounts, knolls and petit-spot monogenetic volcanoes on the subducting Pacific Plate. Basin Research 20, 543-553, doi:10.1111/j.1365-2117.2008.00363.x. J.G. Konter, B.B. Hanan, J. Blichert-Toft, A.A.P. Koppers, T. Plank and H. Staudigel (2008). One hundred million years of mantle geochemical history suggest the retiring of mantle plumes is premature. Earth Planetary Science Letters 275, 285–295, doi:10.1016/j.epsl.2008.08.023. K.P. Lawrence, L. Tauxe, H. Staudigel, C.G. Constable, A.A.P. Koppers, W.C. McIntosh and C.L. Johnson (2008). Paleomagnetic field properties at high southern latitude. Geochemistry Geophysics Geosystems, doi:10.1029/2008GC002072. A.A.P. Koppers (2009). Pacific Region. In: Encyclopedia of Islands, G. R. Gillespie and D.A. Clague, Berkeley, University of California Press, 702-715. P.R. Renne, A.L. Deino, M.T. Heizler, S.R. Hemming, A.A.P. Koppers, D. Phillips, B.S. Singer, B.D. Turrin, I.M. Villa, M. Villeneuve and J.R. Wijbrans (2009). Data Reporting Norms for 40Ar/39Ar Geochronology, Quaternary Geology 4, 346–352, doi:10.1016/j.quageo.2009.06.005. A.A.P. Koppers and A.B. Watts (2010). Intraplate Seamounts as a Window into Deep Earth Processes. Oceanography 23(1): 42-57. A.B. Watts, A.A.P. Koppers and D.P. Robinson (2010). Seamount Subduction and Earthquakes. Oceanography 23(1): 166-173. H. Staudigel, C.L. Moyer, M.O. Garcia, A. Malahoff, D.A. Clague and A.A.P. Koppers (2010). Loihi Seamount. Oceanography 23(1): 72-73. A.A.P. Koppers, H. Staudigel, S.R. Hart, C. Young and J.G. Konter (2010). Vailulu’u Seamount. Oceanography 23(1): 164-165. H. Staudigel, A.A.P. Koppers, J.W. Lavelle, T.J. Pitcher and T.M. Shank (2010). Defining the Word "Seamount". Oceanography 23(1): 20-21. A.A.P. Koppers, H. Staudigel and R. Minnett (2010). 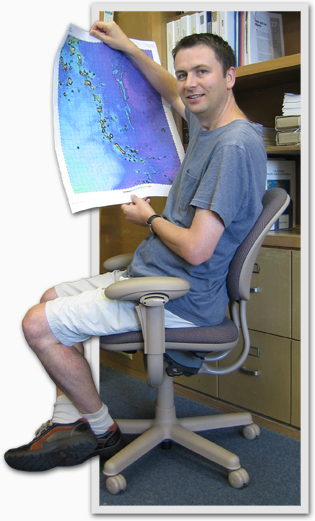 Seamount Catalog: Seamount Morphology, Maps, and Data Files. Oceanography 23(1): 36-37. M.G. Jackson, S.R. Hart, J.G. Konter, A.A.P. Koppers, H. Staudigel, M.D. Kurz, J. Blusztajn and J.M. Sinton (2010). The Samoan hotspot track on a “hotspot highway”: Implications for mantle plumes and a deep Samoan mantle source. Geochemistry, Geophysics, Geosystems 11(12), doi:10.1029/2010gc003232. D.J. Wright, J. Roberts, D. Fenner, J.R. Smith, A.A.P. Koppers, D. Naar, E.R. Hirsch, L.W. Clift and K.R. Hogrefe (2011). Seamounts, ridges, and reef habitats of American Samoa, in P.T. Harris and E.K. Baker (eds. ): Seafloor Geomorphology as Benthic Habitat: GeoHab Atlas of Seafloor Geomorphic Features and Benthic Habitats, Elsevier, Amsterdam. C. Timm, K. Hoernle, R. Werner, F. Hauff, P.v. den Bogaard, P. Michael, M.F. Coffin and A.A.P. Koppers (2011). Age and geochemistry of the oceanic Manihiki Plateau, SW Pacific: New evidence for a plume origin. Earth and Planetary Science Letters DOI: 10.1016/j.epsl.2011.01.025. A.A.P. Koppers, J.A. Russell, J. Roberts, M.G. Jackson, J.G. Konter, D.J. Wright, H. Staudigel and S.R. Hart (2011). Age Systematics of Two Young En Echelon Samoan Volcanic Trails. Geochemistry Geophysics Geosystems, doi:10.1029/2010GC003438. A.A.P. Koppers, M.D. Gowen, L.E. Colwell, J.S. Gee, P.F. Lonsdale, J.J. Mahoney and R.A. Duncan (2011). New 40Ar/39Ar Age Progression for the Louisville Hotspot Trail and Implications for Inter-Hotspot Motion. Geochemistry Geophysics Geosystems, doi:10.1029/2011GC003804. A.A.P. Koppers, T. Yamazaki, J. Geldmacher, J.S. Gee, N. Pressling, H. Hiroyuki and IODP Expedition 330 Science Party (2012). Limited Latitudinal Mantle Plume Motion for the Louisville Hotspot. Nature Geoscience. doi: 10.1038/NGEO1638. A.A.P. Koppers, T. Yamazaki, J. Geldmacher and IODP Expedition 330 Science Party (2013). IODP Expedition 330: Drilling the Louisville Seamount Trail in the SW Pacific. Scientific Drilling 15: 11-22. doi: 10.2204/iodp.sd.15.02.2013. Cromwell, G., L. Tauxe, H. Staudigel, C.G. Constable, A.A.P. Koppers and R.B. Pedersen (2013). In search of long term hemispheric asymmetry in the geomagnetic field: Results from high northern latitudes. Geochemistry, Geophysics, Geosystems. doi: 10.1002/ggge.20174. Sager, W.W., J. Zhang, J. Korenaga, T. Sano, A.A.P. Koppers, M. Widdowson and J.J. Mahoney (2013). An immense shield volcano within the Shatsky Rise oceanic plateau, northwest Pacific Ocean. Nature Geoscience, doi:10.1038/ngeo1934. O’Connor, J.M., B. Steinberger, M. Regelous, A.A.P. Koppers, J.R. Wijbrans, K.M. Haase, P. Stoffers, W. Jokat, and D. Garbe-Schönberg (2013). Constraints on past plate and mantle motion from new ages for the Hawaiian-Emperor Seamount Chain, Geochemistry, Geophysics, Geosystems. doi:10.1002/ggge.20267. Vanderkluysen, L., J.J. Mahoney, A.A.P. Koppers, C. Beier, M. Regelous, J.S. Gee and P.F. Lonsdale (2014). Louisville Seamount Chain: Petrogenetic processes and geochemical evolution of the mantle source. Geochemistry, Geophysics, Geosystems. doi: 10.1002/2014GC005288. Expedition 324 Scientists (2010). Testing plume and plate models of ocean plateau formation at Shatsky Rise, northwest Pacific Ocean. IODP Preliminary Report 324, doi:10.2204/iodp.pr.324.2010. W.W. Sager, T. Sano, J. Geldmacher and Expedition 324 Scientists (2010). Proceedings IODP 324: Tokyo (Integrated Ocean Drilling Program Management International, Inc.), doi:10.2204/iodp.proc.324.2010. A.A.P. Koppers, T. Sano, J.H. Natland, M. Widdowson, R. Almeev, A.R. Greene, D.T. Murphy, A. Delacour, M. Miyoshi, K. Shimizu, S. Li, N. Hirano, J. Geldmacher and Expedition 324 Scientists (2010). Massive basalt flows on the southern flank of Tamu Massif, Shatsky Rise: a reappraisal of ODP Site 1213 basement units. In W.W. Sager, T. Sano, J. Geldmacher and the Expedition 324 Scientists, Proc. IODP, 324: Tokyo (Integrated Ocean Drilling Program Management International, Inc.) doi:10.2204/iodp.proc.324.109.2010. Expedition 330 Scientists (2011). Louisville Seamount Trail: implications for geodynamic mantle flow models and the geochemical evolution of primary hotspots. IODP Preliminary Report 330, doi:10.2204/iodp.pr.330.2011. A.A.P. Koppers, T. Yamazaki and J. Geldmacher and IODP Expedition 330 Science Party (2012). Proceedings IODP 330: Tokyo (Integrated Ocean Drilling Program Management International, Inc.), doi:10.2204/iodp.proc.330.2012. A.A.P. Koppers (2011). Mantle plumes persevere. Nature Geoscience 4(12): 816-817. doi: 10.1038/ngeo1334. Humphries, S.E. and A.A.P. Koppers (2013). Planning for Future Directions of Scientific Ocean Drilling With the D/V JOIDES Resolution. Eos, Vol. 94, No. 26, 25 June 2013. Expedition 349 Scientists (2014). South China Sea Tectonics: Opening of the South China Sea and its implications for southeast Asian tectonics, climates, and deep mantle processes since the late Mesozoic. IODP Preliminary Report 349, doi:10.2204/iodp.pr.349.2011. Hotspots and the associated intra-plate volcanism producing seamount trails are amongst the most significant observations supporting plate tectonics. The azimuths and age progressions of these seamount trails provide the only means to determine absolute plate motions with respect to an independent reference frame of “fixed” hotspots. However, the fixity and continuity of hotspots are not truly established since most seamount trails older than 25 Ma only have been studied on a reconnaissance level. Many questions remain about hotspot volcanism, concerning (1) the volcanic processes producing seamount edifices, (2) the timing, typical time ranges and possible quiescent periods in volcanic activity, (3) the time-space relationships within seamount trails and the modeled absolute plate motion from these trails, (4) the consequences of the crossing of younger hotspot trails over older hotspot trails, (5) the isotopic and geochemical evolution of hotspots, and (6) the fixity, continuity and longevity of individual hotspots. In this thesis, nine seamount trails of the West Pacific Seamount Province (WPSP) are the focus of a study of their 40Ar/39Ar geochronology and Sr-Nd-Pb isotope geochemistry. This group of seamount trails ranges in age from 70 to 140 Ma and will be used to analyze (1) Cretaceous hotspot volcanism in the Pacific, (2) the tectonic and geochemical relationship between the WPSP hotspots and the currently-active hotspots in the South Pacific Isotopic and Thermal Anomaly (SOPITA), and (3) the stage poles of absolute Pacific plate motion for the last 140 Myr. In these analyses, in particular, the (non-)fixity and longevity of these Pacific hotspots will be addressed. This scientific expedition RR1310 on the Roger Revelle aims to address the hypothesis stating that the Rurutu hotspot in French Polynesia formed a long-lived seamount trail that extends at least into the Tuvalu area and contains a pronounced bend synchronous with the Hawaii-Emperor bend. During this expedition we mapped 50 seamounts and placed in total 62 dredges along the southwest portion of the Walvis Ridge, which begins on the African continent and extends to near the mid-Atlantic Ridge. We drilled five underwater volcanoes to test how much the Louisville mantle plume may have moved over the last 80 million years and whether it moved coherently with the Hawaii hotspot. This special volume is the most up-to-date synthesis of seamount sciences, covering all major scientific issues surrounding seamounts, including their relevance to mantle and lithospheric processes, their volcanic evolution and hydrologic systems, their oceanography and micro- and macro-biology, geochemistry, fisheries and mineral resources, and their conservation. Shawn Doan and Anthony Koppers are riding the waves of the Pacific for the second time to bring you the latest research surfacing during the third FeMO seagoing expedition to the active vents on Loihi volcano. The Iron-Oxidizing Microbial Observatory (FeMO) uses the Loihi Seamount as a natural laboratory for studies of Earth's rust-forming microbial inhabitants to address the basic questions of who they are, how fast do they grow and form rust, where and why do they do it, and what are their environmental impacts? At our CEOAS laboratory we focus on the 40Ar/39Ar dating of MORB, OIB, LIP, lunar and planetary rocks, hydrothermal minerals and clays. We use our MAP 215-50 and ARGUS VI rare gas mass spectrometers for these analyses and a resistance furnace or CO2 laser for gas extraction. The marine sediment and rock collection at the OSU Marine Geology Repository comes from all oceans. As of 2011 it contains over 15,500 meters of sediment from almost 6000 cores, more than 9,000 rocks from 500 dredges, 2200 Manganese Nodules and 1500 sediment trap and 700 plankton tow samples. Anthony gets to work cutting the rocks from dredge 127. Each sample has to be cut into various shapes for processing, and this is the saw we use to do it. The clear water around Wallis island makes it easy to see the unique shape of the Kilo Moana's bow.